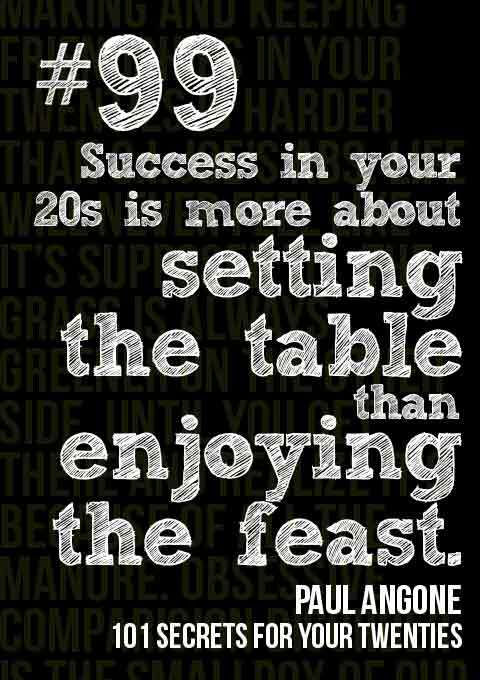 Don’t Waste Your Twenties! | Dream. Write. Lead. As an editor, I read so many books and articles that I don’t often find the time (or desire) to read something for sheer pleasure. But seasonally, I’ll run across an engaging read that I just can’t put down. In the spring, it was Seth Godin’s Linchpin. For the summer, it’s Paul Angone’s 101 Secrets for Your Twenties. You may be thinking, But Adam, aren’t you in your (very early) thirties? Why would this book of secrets for your twenties even be of any value to you? Well, I asked myself the same question. But then I started reading. And strangely, these hilarious and wise tidbits of information have proven to still be of great value to this (ahem) “young” thirty-something. 101 Secrets for Your Twenties is a refreshingly honest compilation of life truths. Paul Angone has cleverly put into words our twenty-something experience, yet with a passionate and purposeful goal of helping young adults navigate this unique stage in life without regret. If you’re like me, you’ll laugh (especially at secrets #5, #17, and #44), ponder (secrets #29 and #43), and say a lot of “Amens!” along the way (secrets #1, #21, and #53). 101 Secrets for Your Twenties (published by Moody Collective) is now available for purchase. And I highly recommend it–especially if you’re in your twenties or early thirties. It makes for an excellent graduation gift for college students as well. To learn more about the book or its author, Paul Angone, visit allgroanup.com.